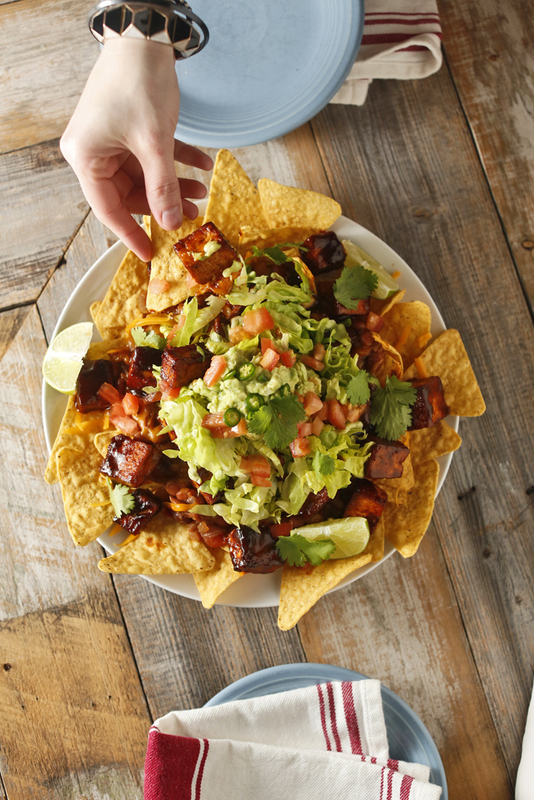 Here at the Chubby Vegetarian, we wholeheartedly endorse Super Bowl Sunday, if only for the wonderful food that will be had by all. Aren't you dreaming of it already? We definitely have a few ideas for the event this weekend, and most involve comfort food on platters and in bowls, lots of heat and spice, and watching our football-loving friends and family lose their ever-loving minds over the game. Here are a few of our favorites that might work well as a part of your own celebration. Go, whoever! 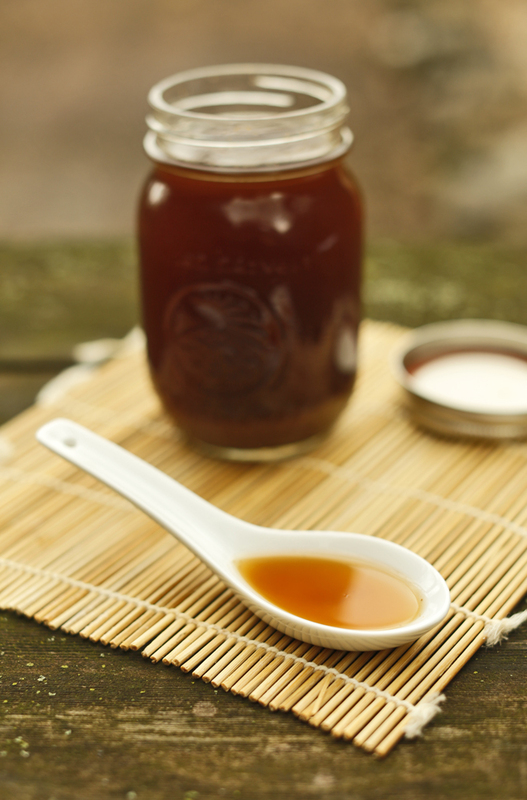 Fish sauce is one of those ingredients that everyone seems to be using now. You see it in everything from cuisine to cocktails. The world has gone fish sauce crazy! 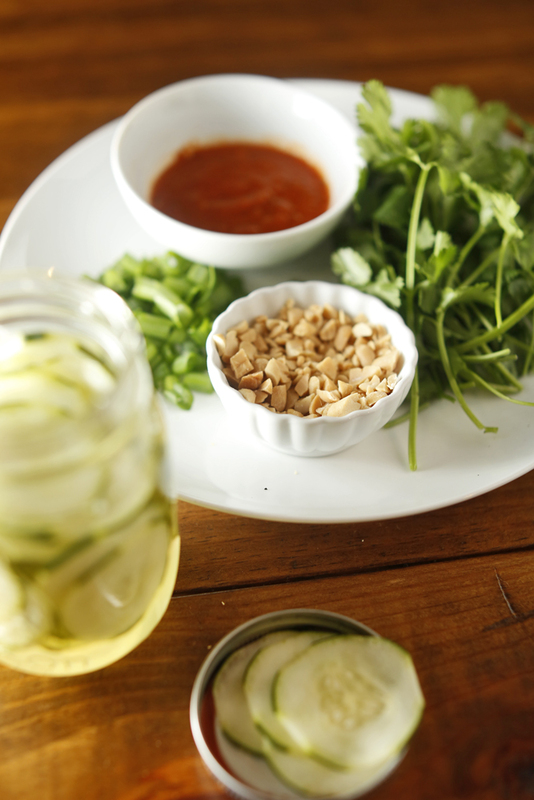 So, what is fish sauce? It's made of tiny fish that are heavily salted and fermented in huge barrels for a year or more. The result is a salty, bacon-y, parmesan cheese-esque sauce that adds a ton of umami flavor to anything it touches. This fish-less fish sauce is perfect anywhere you'd normally use the fishy stuff and from all accounts it tastes pretty close. I first saw a version of it on a Chow message board. I've made some changes to that recipe over the year or so that I've been making my own vegetarian fish sauce. I like to keep some around to use in stir fry, Thai curries, kimchi, and salad dressings. 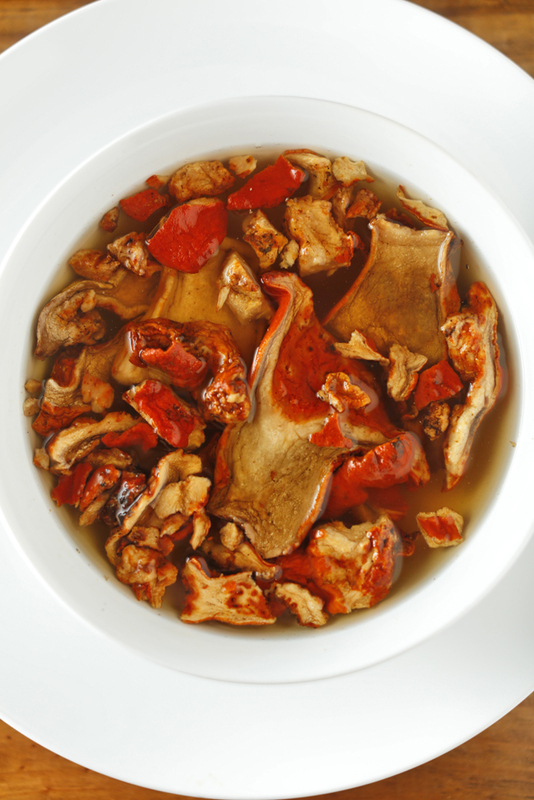 It makes a great addition to stocks and soups that need a little umami bump. In a medium pot over hight heat, bring the water, garlic, red pepper flakes, kombu, shiitake, soy sauce, sugar, salt, peppercorns, ginger, vinegar, lemon juice, and lime juice up to a boil, cover, and reduce to a simmer. Allow mixture to simmer for 25 to 30 minutes, strain, and return liquid to the pot. Reduce mixture to 1 pint. Allow mixture to cool and store in an airtight container in the fridge for up to 6 weeks. This is a vegan version of our Vegetarian Breakfast Sausage. Many TCV readers love it and depend on it, and while we sure are blushing and aw-shucks-ing about that recipe's popularity, we're still never satisfied. 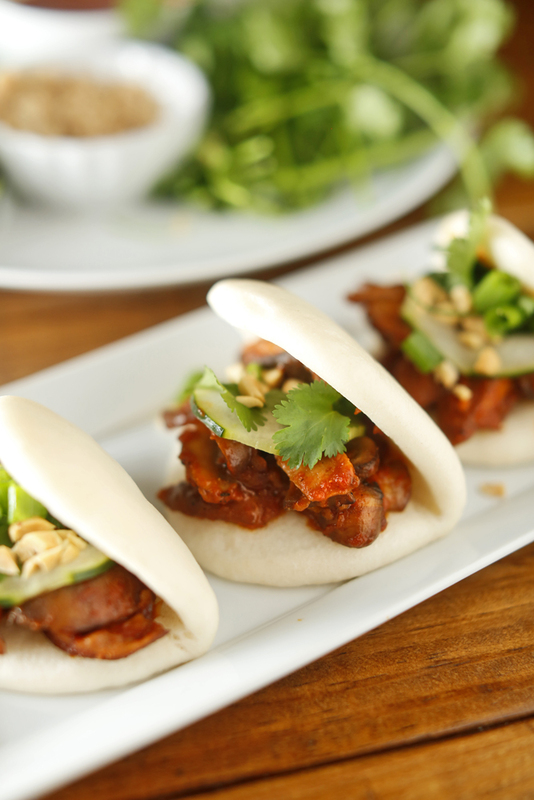 Simplifying and veganizing our original recipe also improved the texture and flavor. Who knew that could be done? 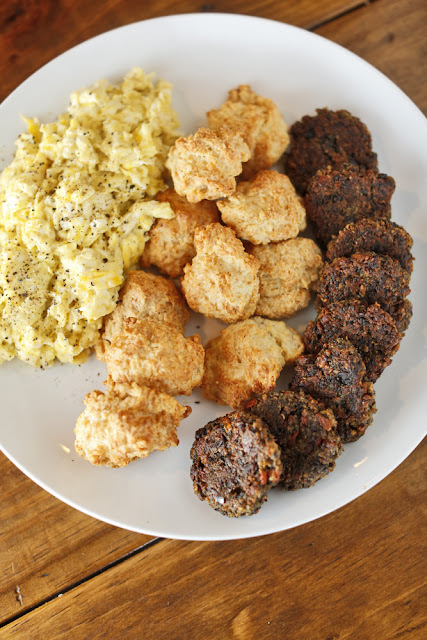 These are great served alongside some eggs or scrambler or use them to make a stellar vegetarian sausage and biscuit using our 3-2-1 Drop Biscuits. You could also get creative and crumble the cooked sausage into the filling for stuffed bell peppers or crumble a little on a pizza with peppers and onions. Basically, you can use it anywhere you'd usually find regular sausage. Heat the canola oil in a large frying pan over medium-high heat. Add the shallot, garlic, mushrooms, celery, and carrot to the pan. Stir consistently and sauté until all of the liquid has released and then evaporated; this should take about 5 minutes. Add the sage, red pepper flakes, clove, nutmeg, soy sauce, and maple syrup to the pan. Stir to incorporate and remove from heat. Allow mixture to cool. Add the uncooked quick-cooking oats and knead the mixture until everything is well incorporated. Add salt and pepper to taste. Cover and set aside in the fridge for at least 15 minutes to allow the moisture to distribute. Next, pinch about 2 tablespoons of the mixture off, roll it into a ball, and flatten it to for a patty. Repeat. In a medium pan over medium heat, pan-fry disks in enough canola oil to coat the bottom of the pan until nicely browned. Drain on paper towels. Serve hot. This recipe makes about 2 dozen sausage patties. Freeze uncooked patties in a single layer then store them in a food storage bag in the freezer for up to 3 months. We have been in our 1950's house in Memphis for 10 years this January. Fixing it up bit by bit has been a blast, but there are always more things we dream about doing to make it more livable and workable. 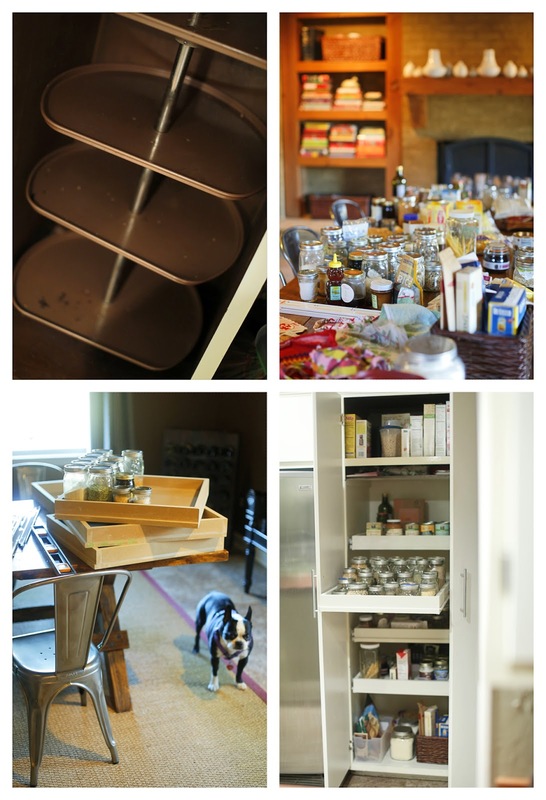 It's a small, cottage-like space where everything needs its own particular area to belong to in order to keep things as organized as we like it to be. Since our kitchen pantry pretty much assured an ongoing state of absolute food-storage chaos, it was about time for it to be overhauled. Really, anything would have been an improvement over this dark cabinet with 4 brown lazy susan trays connected to a metal pole. The shelves were too small for the area, and spinning a metal tray around in order to find stuff in the back when it's loaded down with heavy things just wasn't ever going to work. We lived with it for a long while, like you do when you get used to something that in reality is not that big of a deal in the scheme of things. Yes, there are much more pressing problems in this world and all of that, but since we cook so often, it's fun to look for ways to make putting together a quick meal or making a ton of something for a party or a TCV event or even just finding basic things easier. Long ago, when someone else called this place home, all of the lower-level kitchen cabinets had been constructed with shelves on tracks, so we liked being able to pull out a drawer and grab a saucepan or a baking pan really quickly. Seeing everything on a shelf is pretty cool. So why not do the same thing in the place where most of the food in the kitchen is stored? Our friend and also an amazingly talented carpenter, Doug, was called in to help figure this whole thing out once and for all. He suggested buying the hardware HERE. We cleaned out the pantry, ripped out that crazy trays-on-a-pole contraption, primed the interior of the pantry, painted it, and did the same with the drawer boxes. Once the shelves were installed, we grouped like items and had so much more room. One of the best parts is being able to pare down your food items to what you need to use soon, what you forgot you had but will keep, and what needs to be thrown out (goodbye, 2010-expiration-date soy wrappers!). Grabbing some chips or finding a can of garbanzo beans is going to be so easy now. Anytime you don't have to bend too much or think too hard in the kitchen makes projects like this so worth it. So it's got us thinking about what else needs to be weeded out and reorganized around here. Maybe the new year's to blame, but it sure feels great to do something that will have a huge impact on how we cook at home in 2013. Even the preliminary step of taking everything out to see what we had made a big impact. Tarts are so versatile. In the fall and winter, we love to use mushrooms or potatoes or sliced eggplant, but in the spring and summer, we may make the same basic tart using zucchini and tomato or thinly sliced peppers. We may substitute ricotta for the goat cheese or balsamic for the champagne vinegar or trade out the thyme for rosemary. And don't feel as if you need to be overly concerned about making a pretty crust -- a rustic galette is just as tasty. The combinations are endless. 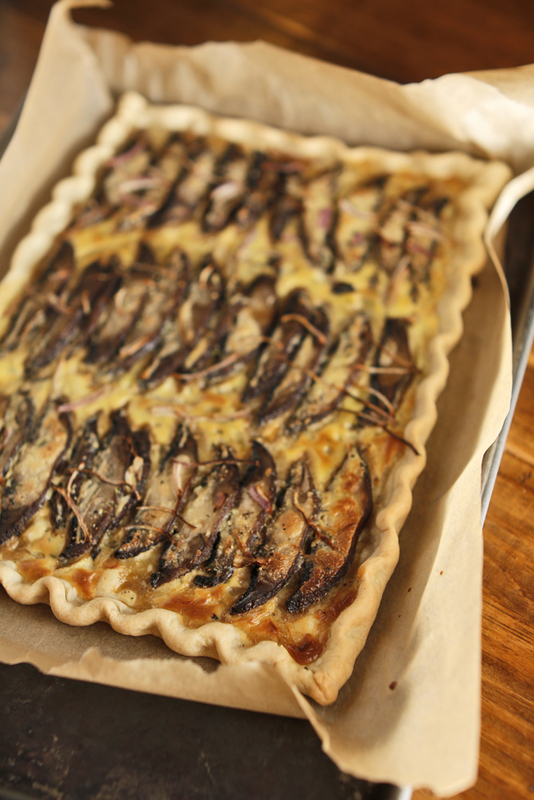 That said, we love this mushroom tart! 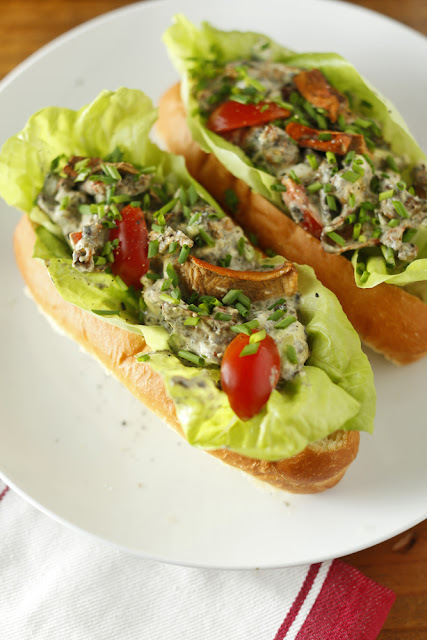 The baked mushroom slices are perfectly meaty, the thyme works its special little magic, and the goat cheese adds the right amount of creaminess to bring it all together. The beauty of this dish is that it is just as good room temperature as it is hot. Make it ahead of time and serve a slice for lunch, or pair it hot out of the oven with a nice little salad for a light dinner. Make the Basic Pie Crust Dough and preheat the oven to 350 degrees. Roll the crust out to roughly a 16 x 11 rectangle and place onto a parchment-lined 17 x 12 baking sheet. Fold the ends up and pinch the corners together. Dock the dough with a fork and par-bake for 10 minutes. I'm reading this really enlightening book by Michael Ruhlman called Ratio. (Thanks for the rec, Jody!) It explains the differences and nuances between many of the wonderful things made with flour, fat, and liquid: crepes, cakes, muffins, pancakes, popovers, biscuits, and pasta and more. How can so many things be made with essentially the same ingredients be so different? The answer is the ratio in which the ingredients are used and the order in which they are mixed. It's a fascinating premise. old-school about it. I use 1 1/2 cups of flour and add 2 eggs. The eggs will pick up all the flour they need. Both methods work. His method is more exacting; mine is more grandma. In the book, he goes into detail about how to add spinach to pasta for color, but says that it doesn't add much flavor. That got me to thinking, how do you add a welcome flavor to plain ol' pasta? I decided toasting the flour might be a good method, and it was. It adds a deep, nutty, fried chicken-esque flavor to fresh pasta. If you are inclined to make your own pasta, I suggest toasting the flour. The result is like nothing else you've ever tasted, and the burnished color is really nice. In a large dry frying pan over medium-high heat, toast the flour by moving it constantly around the pan using a rubber spatula; take care not to burn any part of the flour. Keep turning the flour until it's about the color of a lunch bag and the aroma is nutty and fragrant. Remove from heat and allow to cool. Run the cooled flour through the food processor to break up any lumps that may have formed. 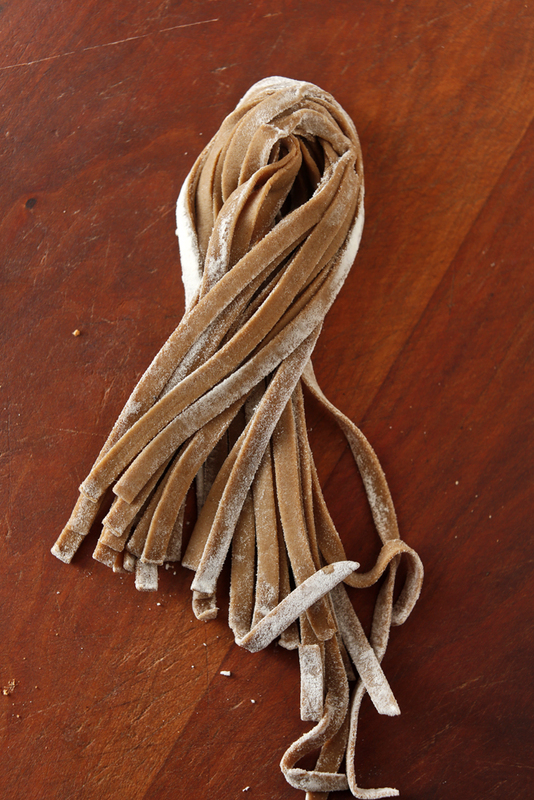 Make pasta according to Ruhlman's ratio and method. In a large frying pan over medium-high heat, heat the oil and add the garlic cloves. Once they stat to brown, add the wine, sugar, and Italian seasoning. Reduce by half. Add the beans and tomato and heat through. Turn the heat off and add the parmesan. Cook pasta and add the pasta directly to the ragout. Toss to incorporate and add a few tablespoons of pasta water if the mixture looks dry. 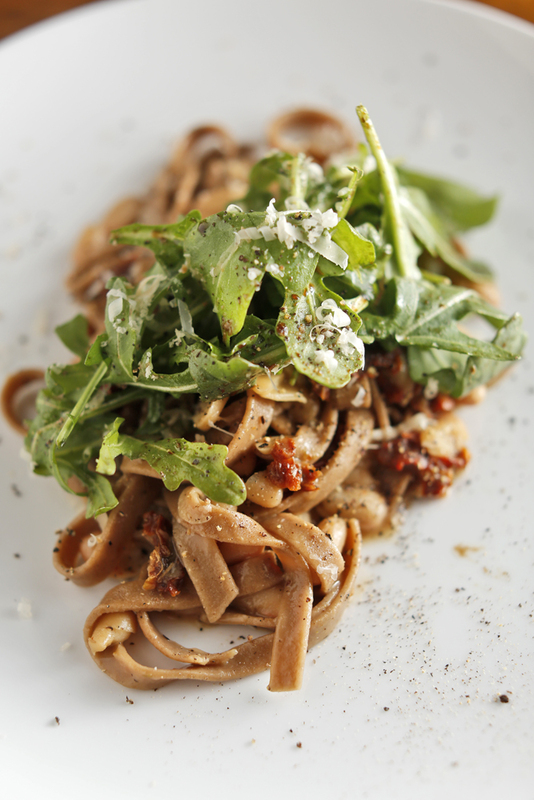 Serve garnished witha little arugula, a drizzle of olive oil, and a bit of balsamic vinegar. *So this is the first thing we made with our toasted flour pasta. What would you do with yours? This is a beautiful marriage of our old mac and cheese with smoked cheddar and truffle oil and a new-ish idea that has been floating around where a humble butternut squash is blended into the cheese sauce to lower the fat and calories of this notorious gut bomb. The bonus is that the butternut squash adds a nice hit of sweetness and moisture to the dish in addition to improving its stats. That's right! 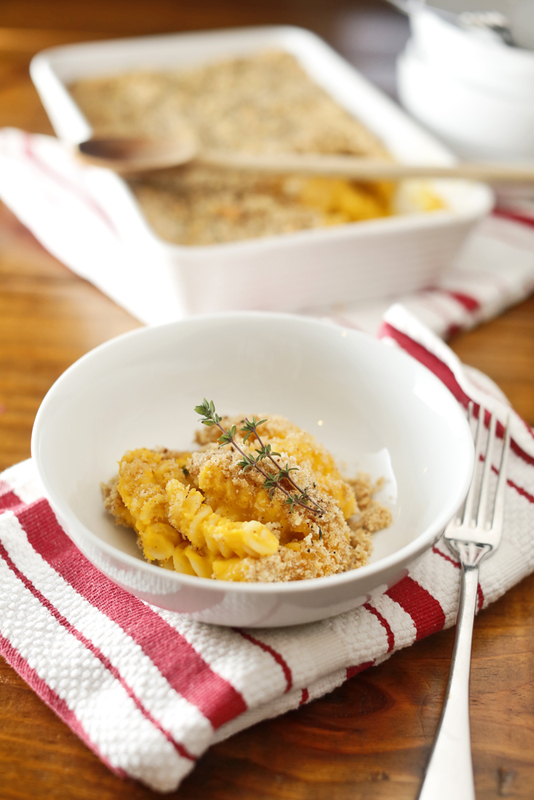 Adding butternut squash makes mac and cheese healthier and better. How rare and wonderful is that? Look for a medium-sized butternut squash that's smooth and firm and heavy for its size. You can peel it using a vegetable peeler and scrape the seeds out using a spoon. It's easy, but if need be, you can use cans of already-ready butternut squash for ease. There are a million ways to cook a butternut squash, but since this recipe already has a big pot of salted water going for the pasta, it's easiest to just throw the squash into the water to cook. 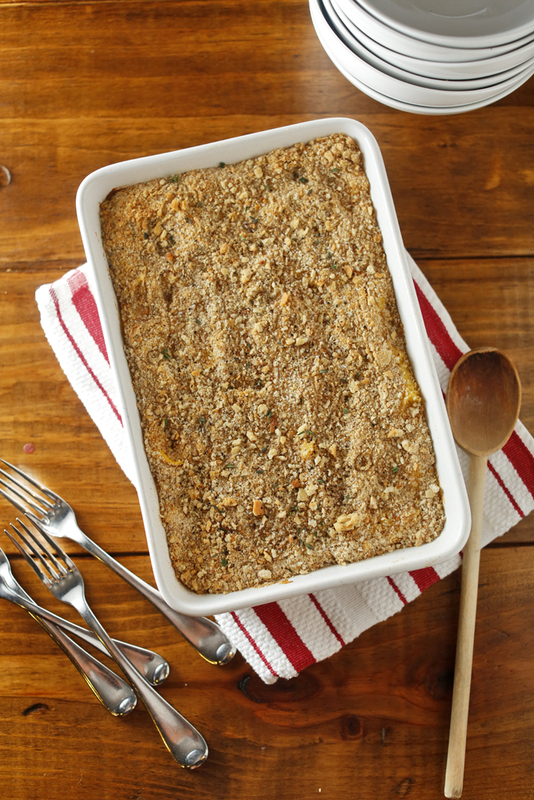 Make this for your family, and even the mac and cheese aficionados will love it. The combination of nutmeg, thyme, and truffle oil is a sure-fire savory combo. Preheat your oven to 350 degrees. Bring a large pot of heavily salted water to a boil. Boil squash and garlic cloves for 5 to 7 minutes or until very tender. Retrieve the squash and garlic from the boiling water using a spyder and place into the work bowl of you food processor. Now in the same water, cook the rotini according to package instructions. Drain water from the pasta and set aside. In a medium pan over medium heat, melt the butter and whisk in the flour. 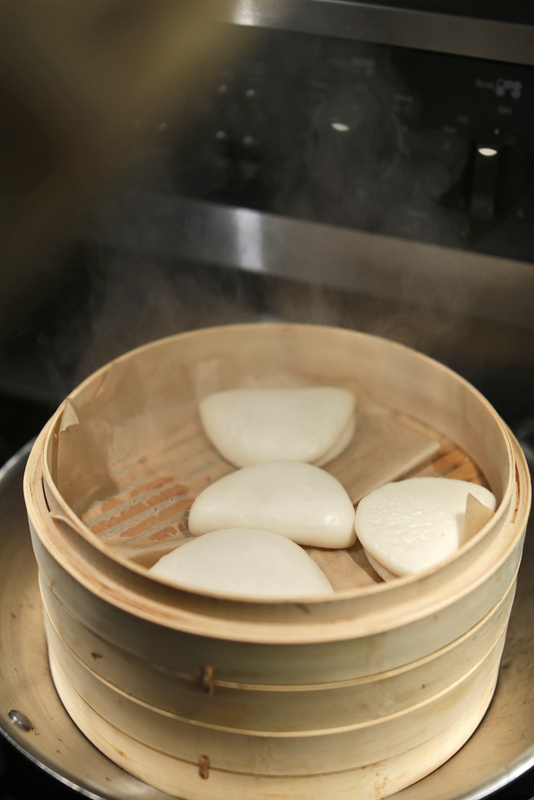 Cook until flour starts to smell nutty and fragrant and begins to lightly brown. Add the milk, continue to whisk, turn the heat up to medium high, and allow mixture to boil. You will notice the mixture has thickened. Stir in the cheese and remove from heat. Add the cheese mixture to the work bowl (the one with the squash) of the food processor along with the salt, pepper, nutmeg and sherry vinegar. Blend until completely smooth. We've had this one for a while, and we just couldn't wait any longer to share it with you. 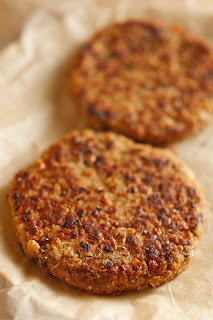 It's absolutely, hands-down, the easiest homemade veggie burger ever! Why? This recipe, unlike many of our other recipes, essentially has only 2 ingredients: well-seasoned beans or peas and dry quick-cooking oats. Mix the two together and...magic. The oats provide texture and hold the patty together even better than any egg-based binder, so as a bonus, the burger patty is vegan, too. The mashed beans provide the moisture and the flavor, so make sure you're using flavorful beans or peas like our recipes for A Really Good Pot of Black-Eyed Peas or A Big Pot of Black Beans. You may use a can of beans as well -- just make sure they're tasty because that is pretty much what the burger is going to taste like. Once you've made the patties, you can dress them up any way you like. 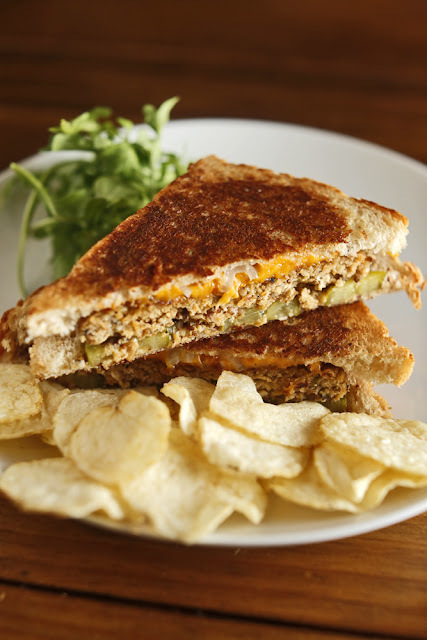 We both love a good patty melt with garlicky pickles, grainy mustard, smoked cheddar, and sliced shallots served on butter-toasted wheat bread. These veggie burger patties would feel equally at home on a soft white bun with plenty of fresh arugula, olive-oil mayo, and thick slices of tomato. That, my friend, is up to you. In a large bowl, mash the black eyed peas using a potato masher or a large fork until no whole peas are left. Add the dry oat flakes and work them into the smashed peas using your hands. Taste and add salt and pepper to taste. Gather the mixture into a ball and cover with plastic wrap. Allow mixture to rest for 15 minutes in order for the moisture to evenly distribute throughout. Using wet hands, form the mixture into 3 or 4 patties. Make sure to smooth the edges of the patty because it makes for a more structurally sound patty. For patty melts, we prefer a larger patty to fit the sliced bread which will yield 3 patties, but for a conventional hamburger bun, which is smaller, you will get 4 patties from this recipe. In a large pan over medium heat cook the veggie burger patties in the canola oil for 3 to 4 minutes per side or until golden brown. Serve however you like. 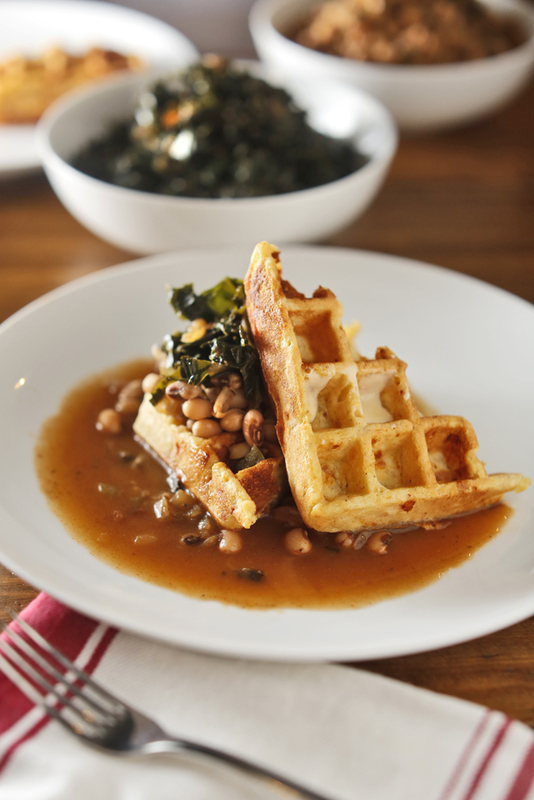 Okay, so this warm dish of cornbread waffles, smoky black-eyed peas, and collard greens may be just the thing for tonight's dinner. It's a tradition in the South (and in parts of the Midwest, from what we understand) to eat black-eyed peas for good luck in the coming year. We also have greens to represent money or wealth. 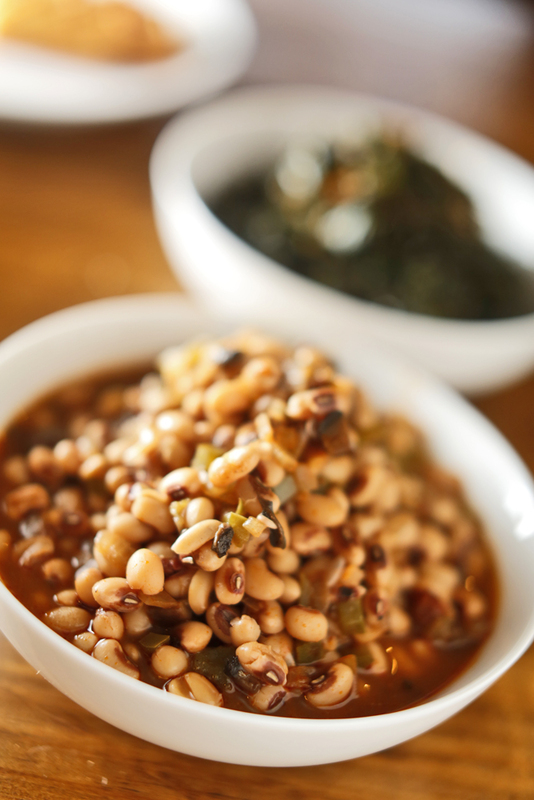 We have both eaten black-eyed peas and cornbread on New Year's Day every year since birth. It's not that we are particularly superstitious -- we just don't want to tempt fate. We think our recipe for Collard Greens with Honey, Shallots, and Mushrooms is great because it's so easy. The greens are blanched in super-salty water to leach out any bitterness, and then they are sautéed with a touch of honey. Our Smoked Cheddar and Jalapeño Cornbread is good enough to star on the cover of our cookbook! This time, we cooked the very same recipe in the waffle maker for 3 1/2 minutes. This recipe will make 7 to 8 waffles. We recommend using both of these recipes when putting this dish together. *Quick-soaking method: Bring a large pot of water to boil, add dried peas, cover, turn the heat off, and then allow beans to soak for one hour. *Quick-soak method: Bring a large pot of water to a boil, add dried peas, cover, turn the heat off, and allow them to soak for 1 hur.